My tapestry frame. The rust-coloured bag holds the flex for the lamp when I’m not using it, and the green bag hanging on the left of the frame is to cover the magnifying lens when I’m not using it, so that I don’t set the house on fire! 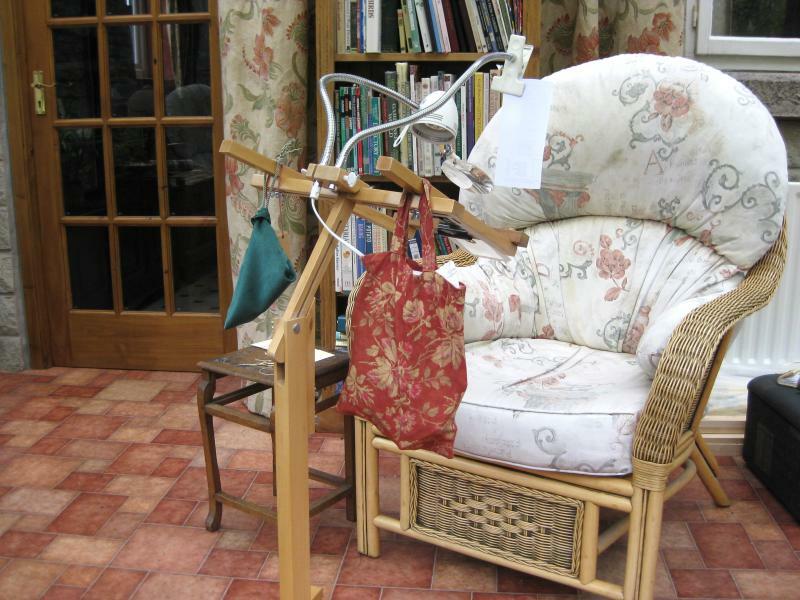 So, I invested in this StitchMaster wooden floor frame – this is it, proudly standing in my conservatory. It cost about £35 at the time. I found it useful from the start. For one thing, I could stitch quicker, as I could use both hands at once! I bought the Daylight bulb attachment with removable 2.25 magnifying lens almost immediately, as I love to do miniature needlepoint. That’s what I sell in my doll’s house embroidery kit business, so I do a lot of stitching on 32 and 40 count silk gauze fabric, and it’s a lot more comfortable to do with a suitable magnifier. The one for this frame is good, as it is right there attached to the lamp, so I always have good light and magnification at the same time. The lens is rimless, which is more restful on the eyes. 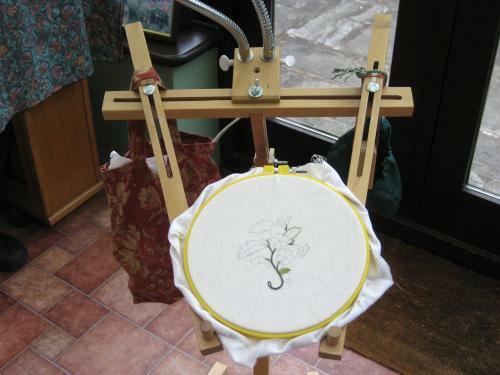 The frame can take hoops, rotating frames (both of which just rest on the dowels at the end of the ‘arms’), and, with the help of my husband and his woodworking shed, my stand has a special attachment that slots over the dowels so that I can clip my silk gauze in its card mount onto the frame, too. Recently, I decided to get the other attachment that goes with this model – the chartholder clamp. Before that, I’d used a bulldog clip to attach my charts to the arms of the floor frame, but I decided I’d like the ‘proper job’. However, once I started searching online, I realised that almost all websites were mysteriously ‘out of stock’ of the attachment. I found a couple of sites that said they had them – until I tried to order from them, and then I was told that, actually, they didn’t have them in stock at all. So, I looked on the manufacturer’s website, and, sure enough, the chartholder and lamp attachment had both been discontinued – because the frame seems to be on its way out, too. What a shame! It’s a wonderful product, and does just what you need it to. The floor frame itself is very adjustable for all kinds of needlework frames, as they just rest on the ‘arms’. It doesn’t slowly collapse, like several other makes of floor frame tend to, as it has a nifty ‘wedge’ that supports the main upright piece. The wingnuts stay tight – there’s even a wooden block that comes with it, to help you tighten the wingnuts without hurting your hand. So, why should it be on its way out? Well, because there’s a shiny new METAL floor frame that’s been introduced to replace it. 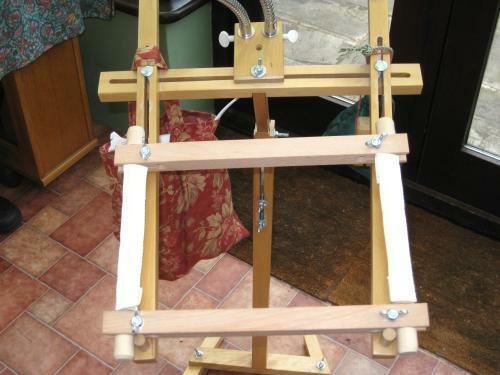 It’s called the new StitchSmart metal stand – the blurb about it on the website starts with the words ‘Wooden stands are over’. Oh dear, I do hope not. 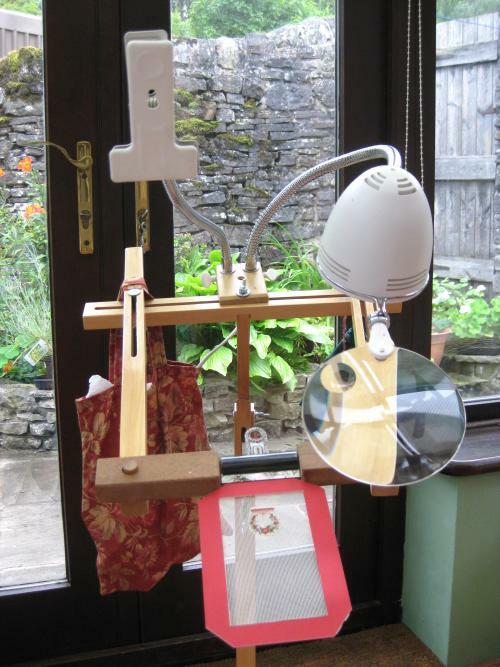 Apart from anything else, this shiny new metal one costs £80, with the chartholder and lamp/magnifier accessory pack (only available as a set, now) costing an additional £90. It all seems to be getting a bit expensive, and ‘modern’ for the sake of it ….. I looked on Ebay (always a good place to look for discontinued things), and found someone selling one for £4.99. So I bought it, got it within 3 days, and have been using it ever since. Lovely. 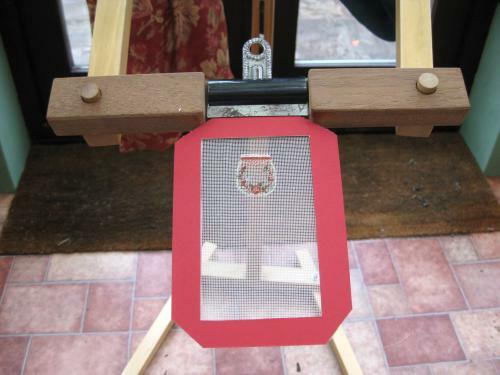 My frame with all its attachments in place, ready for a nice long session of stitching! So, if you fancy getting a very good floor frame to help with your stitching, I wouldn’t leave it too long, as even needlework accessories seem to be getting a bit trendy!